Chula Vista is a welcoming city with idyllic views just south of San Diego. Chula Vista is positioned along California’s South Bay and features other scenic wonders with the foothills of the Jamul Mountains and the Sweetwater Marsh. In recent years, more people have discovered the beauty of Chula Vista and the city has seen substantial growth. If a move to Chula Vista sounds appealing, it is beneficial to learn more about the area before finding the best Chula Vista movers to organize the transition. Although the South Bay has been inhabited for centuries, Chula Vista saw a spike in population growth after World War II due to the presence of Rohr Aircraft Corporation, which manufactured vast quantities of goods for the war. Today, Chula Vista is experiencing another boom in population because of its pleasant climate. Chula Vista is home to one of the few U.S. Olympic Training Centers that is open all year. Other attractions in Chula Vista include the Chula Vista Marina, the OnStage Playhouse and the Otay Valley Regional Park. Overall, the area has plenty of opportunities for a wide range of leisure activities including golfing, shopping, walking, and more. 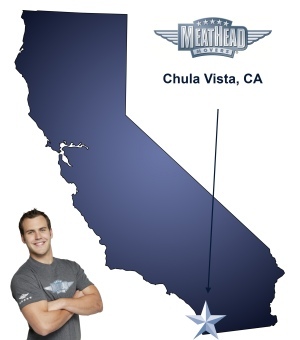 In order to make the transition to Chula Vista, consider Meathead Movers. Meathead Movers is an elite moving company, which has been operating in California for over fifteen years. To best serve clients, Meathead Movers offers a range of services and can help with all types of moves. Whether the move is across town or a long distance trek, Meathead Movers can get the job done with no hassles. Meathead Movers also offers Princess Packers to help with all your packing needs. Other services include storage, on-site moves and commercial relocations. While these services are impressive, Meathead Movers is not like other Chula Vista movers. Meathead Movers carefully recruits student athletes, then thoroughly trains them ensuring that all Meathead moves are fast, efficient and smoke-free. In fact, to fully demonstrate the Meathead Difference, all employees jog on the job when they are not carrying anything—saving you valuable time. Any move to Chula Vista is sure to be a smart one. Relying on Meathead Movers is an even smarter choice. Contact Meathead Movers for a free moving quote today. Moving to Chula Vista? Here are some helpful resources. View more Chula Vista resources. The three guys were hardworking, polite and courteous. The experience with Meathead Movers was outstanding. We had a very tight schedule and although we got a bit of a late start the three Meatheads were focused, efficient, careful, polite and caring of our situation. (Moving a loved one who has dementia). Spencer, Davis and Ezekiel were the greatest. The phone contacts I had with the staff were smooth and reassuring. Thank you all. Jeanne M.
You lost my 3 glass shelves. To make it right find them they have got to be on one of your trucks.